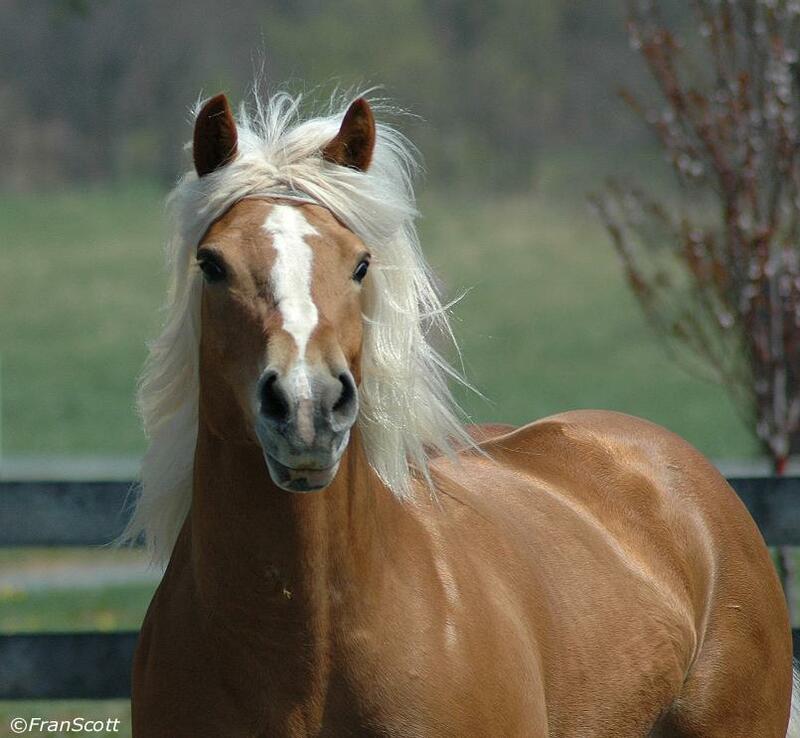 “Lady” is an AHR GOLD classified mare that is sired by the well-known stallion, Aristocrat TOF, and out of the dam Libee HFB. Aristocrat TOF himself bears little introduction. Aristocrat was imported from Austria in 1993 and is an AHR GOLD classified stallion and a former AHR National Champion stallion. Aristocrat TOF is descended from the strongest and easily the most outstanding mare line in Europe, most notably: Rikka (his grand-dam), Rialta (his dam), and Rimalda (his full sister). Based on the performance of his offspring at AHR inspections, siring to date two gold classified offspring and 13 silver classified offspring, he has also earned the distinction of being an “Elite” stallion according to the AHR. Libee’s Lady of Pewamo was AHR GOLD classified in 2001. This exceptional 60” mare captures your attention with her sheer presence and spectacular metallic gold color. She has a smooth, forward moving rhythmic gait. Since her arrival at Genesis Farm, “Lady” didn’t waste any time winning over our hearts. She has demonstrated to us that she doesn’t just have GOLD stamped onto her AHR inspection card; she also has a heart of pure gold! Lady’s ultra-sweet personality and her eagerness to please have quickly made her into a favorite among the mare herd at Genesis Farm. She is well broke to drive and ride and is currently working on show ring etiquette in preparation for the 2009 show season. On April 1st, 2009, Lady presented us with an exceptional filly out of our two-time AHR ‘National Champion Stallion’ and three-time AHR ‘Stallion of the Year’, Arno van het Nieshof. This eye-catching filly was promptly named “Limelight of Genesis” based on the way she simply seemed to just bask in all of her visitors’ compliments towards her with an expression that seemed to say “I’m beautiful and I know it—look at me!”. Originally, it was our intent to breed Lady to Windstar van de Ooste for a 2010 foal but we completely changed our minds when we saw the result of crossing her genetics with those of Arno! “Limelight of Genesis” promises to be spectacular in every sense!